It’s hard to find a contact center solution that fits your business needs. Look no further. Nectar Desk is the contact center solution that will transform your call center. Cloud provided technology is the kind that makes it easy to add on basic tools. Automatic updates occur twice a year as well as the technology supports many institutions. This contact center solution aids commerce increasing market shares and thus profits too. Nectar Desk cloud contact center software is capable of reducing data processing budget. An array of tools to use and little startup costs; this technology is preferred by many. Because of it being a cloud contact center solution, it is unnecessary to purchase, organize or update their gadgets. No matter what kind of center owned, saving large sums of money is guaranteed. The procedure of paying with the progress made in the contact software means only payments for the utilized tools are made. As it can be scaled to individual business needs waste can be avoided. Even holiday seasons are all sorted. As needs change drastically this is no problem for the contact center management software. Mostly, updating regularly is a necessity in an attempt to avoid disturbances. However, with the contact center services made available this is done by us twice a year making your whole experience more comfortable. This is included registration fee. Through technology switch over, management could be comfortable as workload becomes divided between us. As we support centers at multi-site locations, everything can be organized from one base. Nectar Desk could greatly improve standards of your contact center as a service. 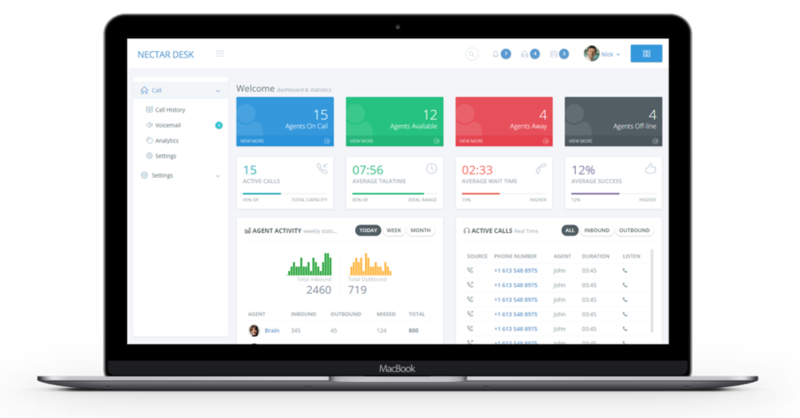 Nectar Desk contact center solution also leverages CRM integrations with Zendesk, Active Campaign, Pipedrive, and Teamwork Desk to make the best use of these features. But that’s not all. Nectar Desk contact center software is on the cutting edge of technology. We provide an analytics dashboard that will save your business time and money. Doing comparisons to competitors like Five9 and Aircall will clearly show why Nectar Desk contact software management is the best solution for an international phone number.